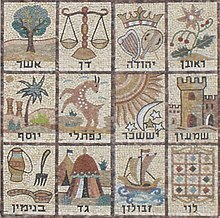 The Israelites (Ebreu: בני ישראל‎‎ Bnei Yisra'el) war a confederation o Airn Age Semitic-speakin tribes o the auncient Near East, that inhabitit a pairt o Canaan in the tribal an monarchic periods. ↑ "Israelite". Random House Webster's Unabridged Dictionary. ↑ Finkelstein, Israel. "Ethnicity and origin of the Iron I settlers in the Highlands of Canaan: Can the real Israel stand up?." The Biblical archaeologist 59.4 (1996): 198–212. ↑ Finkelstein, Israel. The archaeology of the Israelite settlement. Jerusalem: Israel Exploration Society, 1988. ↑ Finkelstein, Israel, and Nadav Naʼaman, eds. From nomadism to monarchy: archaeological and historical aspects of early Israel. Yad Izhak Ben-Zvi, 1994. ↑ Finkelstein, Israel. "The archaeology of the United Monarchy: an alternative view." Levant 28.1 (1996): 177–87. ↑ Finkelstein, Israel, and Neil Asher Silberman. The Bible Unearthed: Archaeology's New Vision of Ancient Israel and the Origin of Sacred Texts. Simon and Schuster, 2002. This page wis last eeditit on 5 Januar 2018, at 02:08.